Jonathan Fairbanks was born about 1594 in Halifax parish, West Riding of Yorkshire, England. No record of his birth has been found. That has led to some controversy over the parentage of Jonathan. All of the potential parents were from the Halifax parish, West Riding, Yorkshire area of England. The most recent information on the English Fairbanks lineage are by Ruth Fairbanks Joseph and James Swan. Joseph, Ruth Fairbanks and James Swan. “Jonathan Fairbanks of Dedham, Massachusetts, and His Family in the West Riding of Yorkshire.” New England Historical and Genealogical Register 166 (2012): 165-87. In the 1897 Lorenzy Sayles Fairbanks published The Fairbanks Family in America, the family genealogy. On May 20, 1617, Jonathan Fairbanks married Grace Lee Smith. He was about twenty three years old and she was twenty. Grace was baptized in Sowerby, just across the Calder River from Warley. Their marriage was registered at the St. John Church, Halifax, Yorkshire, England, about 5 miles from Sowerby or Warley. The law dictated that all marriages and baptisms were to be registered at the Halifax church. After they were married, Jonathan and Grace lived in Warley. Joseph, Ruth Fairbanks. "The English Paternity of Jonathan Fairbank of Dedham, Massachusetts: A Re-consideration" Private copy of her research. major industry in 1600’s Yorkshire, England. Warley and Sowerby were towns that hugged the steep hillsides of the Pennine Mountains. The Pennines coursed north and south between Yorkshire and Lancashire counties in England. In the forested valley, the Calder River tumbled over a rocky riverbed. Highwaymen or thieves infested the valley forests awaiting unsuspecting travelers and merchants who had to travel along this route. The area is now called Calderdale. The rocky, steep hillsides were broken into small stone fenced plots. The ground was not suitable for farming. Small gardens supplied the individual homes, but surplus quantities were not grown for trade. The families would sometimes raise chickens and a pig. Many had a small horse for carrying coal, woolen produce, and supplies. The families went to fairs to buy produce they couldn’t grow themselves, including meats in autumn. Most families in that area were involved in the wool trade. Some sheep were raised there, but much of the wool was brought in from adjoining areas. Homes were individual enterprises with a room built for spinning and weaving woolen fabrics. Small streams of water were diverted by the house for use in preparing the wool. 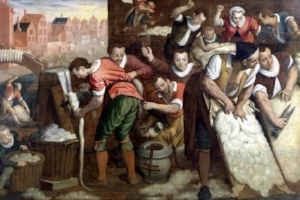 The wool trade was a major business in all of England. The government dictated what kind of fabric each area could produce. West Yorkshire produced Kersey, a course thick-woven woolen fabric. We recognize this kind of wool today in Pea coats and horse blankets. Many Fairbanks of the area were in the woolen trade. Jonathan had enough money to take his family of eight and two indentured servants to New England in the early 1600’s. He provided for them for several years and built a big impressive house in 1637 in Dedham, Massachusetts Bay Colony. That would have taken a respectable income and savings, made possible in the woolen trade. Though there is no documentation, we believe Jonathan participated in the wool trade in England. Thanks to Shawnee Fairbanks Korff who has studied and traveled to Yorkshire and Lancashire, England, and contributed information. Jonathan and Grace moved several times in the West Riding area before they moved to New England in the early 1600’s. That was common in England. They stayed within a thirty mile radius of Halifax. Their moves in England can be documented by the baptismal records of most of their six children. Four of the children’s baptisms were registered in the Halifax parish at St. John’s church. John, the oldest son was born in 1618 in Warley, England. When George (1619) and Mary (1622) were born, the family lived in Shelf. Jonas was born in 1625 in Warley. The family lived in Thornton-in-Craven when Susan was born in 1627, she was baptized in the Thornton-in-Craven Parish. It is believed that they returned to Sowerby when Jonathan was born. This is the town they left when they sailed for New England. Fairbanks, Lorenzo Sayles Fairbanks. Genealogy of the Fairbanks Family in America, 1633-1897. Boston: Fairbanks Family in America, 1991. Joseph, Ruth Fairbanks. "The English Paternity of Jonathan Fairbank of Dedham, Massachusetts: a Re-consideration." The Fairbanks settled in the Massachusetts Bay Colony. They came as a family. Jonathan would have been about forty years old. Grace would have been about thirty-seven. Their children ranged from about sixteen to eleven years of age. Those coming to this colony seemed to move in groups of families, friends, and congregations. Most were the middle-class English, who could afford to sail to the new world. Fewer wealthy came. They found it more comfortable to remain in England. Have you ever noticed that much of you history seems to be based on your last name? Half of our genetic makeup and most of our moral and social upbringing and our education fell to the maternal side of the family. Therefore, you could argue that we have the genetic potential of being a mix of both families, but culturally, we may be more influenced by the maternal side at least at a young age. The next blog features John and Mary (Gawkroger-Platts) Prescott from Northern England, the maternal side of this Fairbanks line.